Big Macher and jockey Tyler Baze, inside, hold off Goldencents (Rafael Bejarano), outside, to win the Grade I, $300,000 Bing Crosby Stakes, Sunday, July 27, 2014 at Del Mar Thoroughbred Club, Del Mar CA. Big Macher, the horse that put Richard Baltas “on the map,” so to speak, is back. The seven-year-old California-bred gelding, claimed out of his first race for $20,000 on July 17, 2013, makes his first start in more than a year and half when he runs in next Saturday's $100,000 Thor's Echo Handicap for three-year-olds and up at six furlongs at Santa Anita Park. A bay son of Beau Genius, Big Macher worked five furlongs from the gate Sunday in a minute flat under Rafael Bejarano, who rides him in the Thor's Echo. 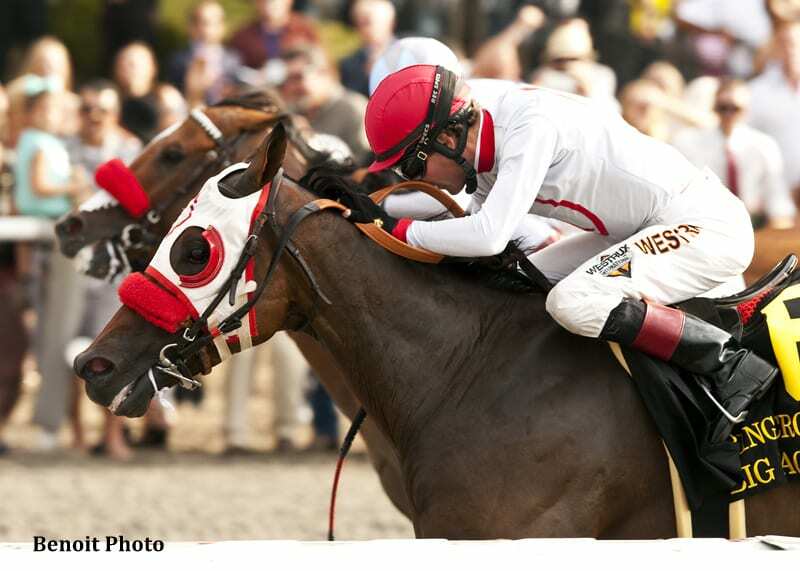 Big Macher caught the eyes of the racing world when he won the Grade I Bing Crosby Stakes at Del Mar on July 27, 2014, nine races after he was claimed. Baltas estimates Big Macher has earned some $600,000 for owners Tom Mansor and Tachycardia Stables since being haltered. “When he won the Bing Crosby, it was the first Grade I win I ever had, so it helped put me on the map,” recalled Baltas, currently second in Santa Anita's trainers' standings with 18 victories from 74 starts, 24 percent. “But there's more to it than that, more to it than the money. Big Macher took us to Dubai, he took us to two Breeders' Cups. He was one of my breakthrough horses, for sure, but I always look at a horse for what it can do for the owners. This entry was posted in Racing and tagged beau genius, Big Macher, Bing Crosby Stakes, California-bred, Del Mar, rafael bejarano, Richard Baltas, santa anita, santa anita park, thor's echo handicap by Ed Golden/Santa Anita. Bookmark the permalink.